We were up as usual at 6am to pack our bags ready for petit de jeune at 7am. Her breakfast was great and we thanked her to no end for the food and heat in the room. 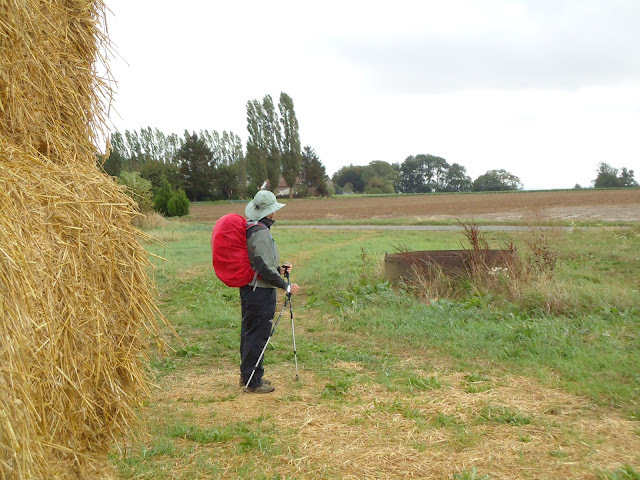 We had a little trouble finding our way out of Bapaume in the early light but managed to do so after asking people along the way. The weather is overcast and about 14c. The winds seem to pick up about 11am and it is cool. We generally stop for 15 minutes every two and a half hours to have bread and cheese or fruit. We seem to have developed a chocolate 100gm thing lately. 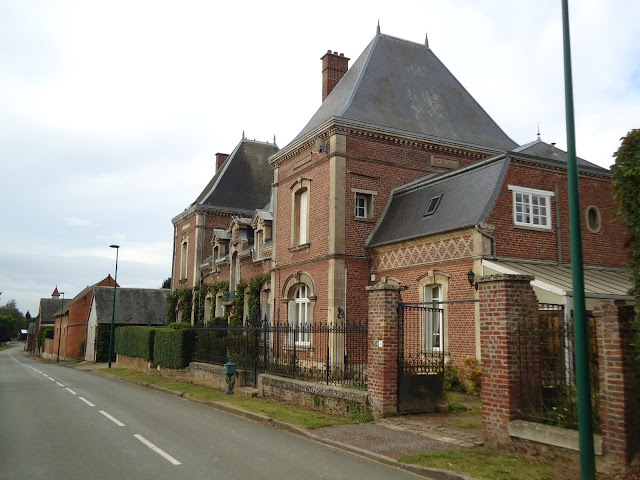 We had no trouble finding our way today but arrived in Peronne tired. We went to the tourist office for a city map and to see if they could make some bookings for us. She could speak very good English but she was more interested in just giving us a paper and sending us on our way. We found our hotel that was booked a few days ago. 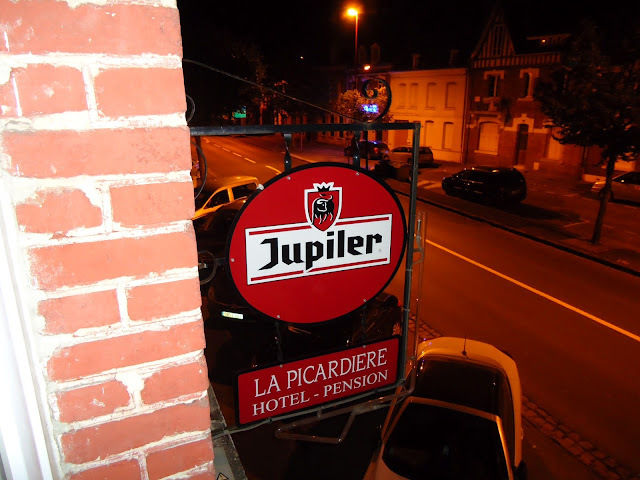 The name will be forever in my mind, hotel Picardiere. 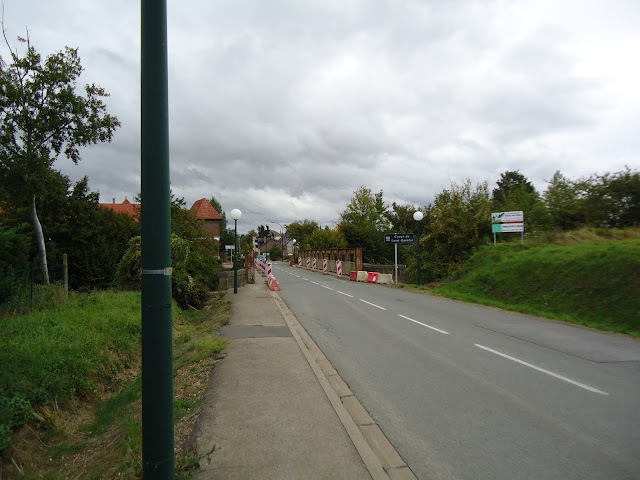 During World War Two Peronne was very heavily bombed. Unfortunately the bombs missed this place. It is tied with the one in Dover for zero stars. We were told when we got there that we had got the last room. Well there was a single bare bulb in the ceiling, no hooks or hangers for clothes, the sink gurgled continually and the bedding what there was, was awful. The price was 35e if you can believe it. My partner used the term flop house. This was the first day we skipped dinner and got 2 tins of beer, peanuts and fruit instead. We usually scout out the way out if town the night before so we don't have a problem in the morning. The instructions were quite clear and we found the streets and the old rail bed that we thought was right, but it said to exit by house number 45. We went back and forth I don't know how many times but we could not find Maison number 45. We went back to our humble abode rather unsure whether we had the right way out if town in the morning. Oh yes the toilet was down the hall and wouldn't you know it, plugged. Fortunately I have the right partner who said, it is only for one night.